Put your name ideas to the vote! Share your names via Facebook, Twitter, or email and get ratings from friends, colleagues, or other internet users. You will then receive statistics telling you how well your name ideas performed. 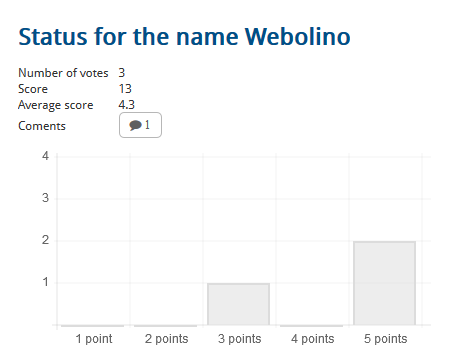 Create a voting for every good name idea in your Word Depository and let the name be rated by your visitors. Each name can be rated with 1 to 5 stars. Voters can also leave a personal comment on the name. To collect as many votes as possible for your name ideas, you can share the voting link conveniently in various social networks. Share it directly to Facebook and Twitter - or send your friends an e- mail with the voting link via the Social Vote tool. Once you have collected enough votes, you can evaluate the results. How many votes were cast, how did a name score, how are the votes distributed, and what are the comments on your name ideas? 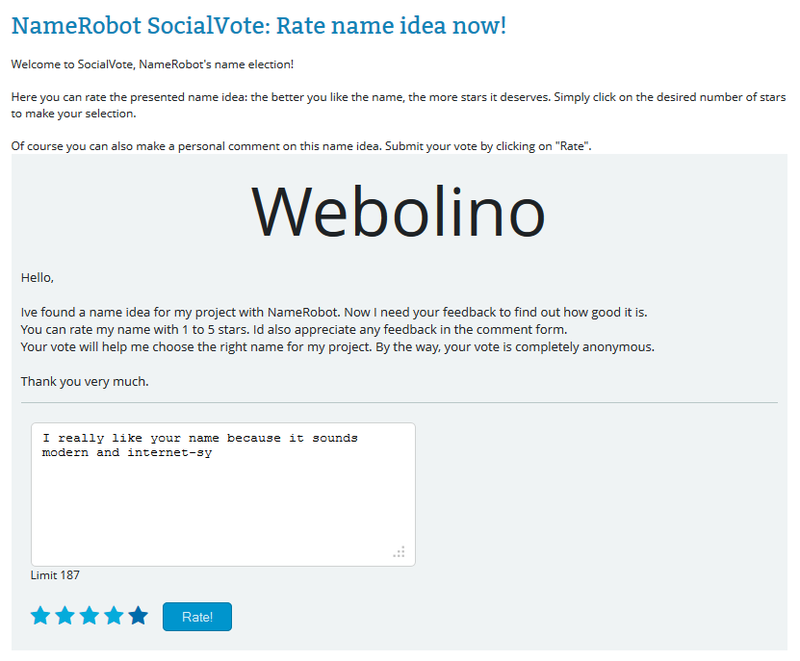 With Social Vote, you have a convenient tool at hand to allows you to assess your name ideas online. Go to the Social Vote tool in My Names right now to test it out! If you don't have a NameRobot account yet, simply register and start looking for a name!